Tiffany & Co Spain 925 Sterling Silver Man In The Moon Baby Feeding Spoon 6"
For your consideration is a Tiffany & Co. Spain .925 Sterling Silver Man In The Moon Pattern Baby Feeding Spoon in excellent pre-owned condition. This spoon shows no signs of wear and looks brand new. Features Tiffany & Co.'s own "Man In The Moon" pattern crafted in fine sterling silver. Spoon measures 6 inches in length and 0.8 inches in width. Weighs 31.6 grams. 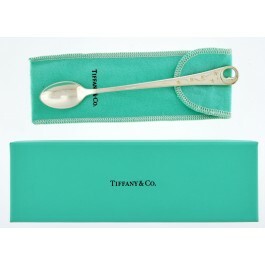 Comes with it's original Tiffany & Co. box and pouch. Please view our photos for additional information. All of our pre-owned items are guaranteed authentic. If an item comes with box and papers it will be pictured and described. If there is no mention of box and papers, the item will not come with it. Mint / Brand Tiffany & Co.
You're reviewing: Tiffany & Co Spain 925 Sterling Silver Man In The Moon Baby Feeding Spoon 6"